- CHINE : Pingdingnao - Researchers have made important discoveries during excavations, including stonemason workshops, a pottery workshop complex and kilns as well as some tombs with stone chambers. They have unearthed a large number of precious earthenware and stone objects as well as a small number of copperware and jadeware, which were mostly produced during the Shang, Zhou, Qin and Han dynasties. 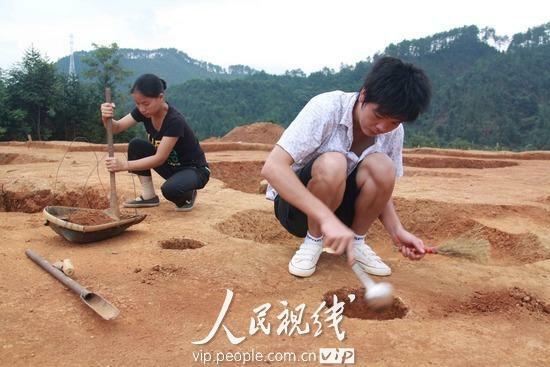 Experts said that the archaeological excavation has proven that there were already people living in Tonggu County 4,500 years ago, and has also greatly enriched the ancient culture in northwestern Jiangxi Province. - ROYAUME-UNI : Eddisbury - A dig to reveal and explore an Iron Age hillfort beneath the surface of Eddisbury Hill is in its final week. 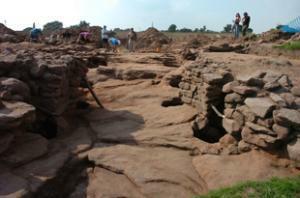 The true extent of the fort in Delamere has been unveiled. The entrance to the Eddisbury Hill hillfort has seven sets of post holes, each as big as a tree trunk, and guard rooms. Parts of its original walls can still be seen. The dig is part of a Habitats and Hillforts project to conserve and enhance the string of six Iron Age hillforts along the sandstone ridge. They are also looking into how the hillforts may have related to each other and are planning a project called ‘Hillfort Glow’ in December to find out how well forts in North Wales and Cheshire can see each other. We don’t really know where tribal boundaries are and intervisibility may define tribal areas. - ROYAUME-UNI : Londres - Iron Age human remains have been unearthed during the construction of a new school in south west London. Burials of children and animals discovered at the site in Carshalton are believed to be more than 2,000-years-old. Archaeologists have traced numerous finds to the Iron Age and Roman era. Experts, who said it was one of the most important finds in the capital in recent years, believe the area was once a small farming community made up of earth and timber roundhouses with thatched roofs. A very large number of domestic animal skeletons have been recovered - including horses, cattle, pigs, sheep, goats and dogs. These animals which were either whole or partly dismembered appear to have been deliberately sacrificed and deposited in deep (up to 4m) pits cut into the chalk bed rock. This may represent some form of 'closure' ritual when the settlement passed out of use with the pits perhaps originally representing grain stores. - INDONESIE : Punjulharjo - A funding shortfall has threatened to sink the planned development of a maritime museum in Punjulharjo village in the Central Java. Preservationists say the museum, which would be built around the remains of the oldest-ever ship to be discovered in the archipelago, requires five hectares of land. Villagers discovered the 1,200-year-old vessel on July 26, 2008, as they were digging a pond in what had been a coconut grove. Carbon dating tests performed in the United States suggested the ship was built in the seventh century. Measuring 47 meters long and 15.2 meters at its widest point, the hull of the ship was found at a depth of about 1.5 meters, about 200 yards inland. Among the wooden remnants were a stone statue of a woman’s head with distinctive Chinese facial features, human bones and a few kitchen appliances. Archeologists have said the ship dates back to the ancient Mataram kingdom in Central Java. 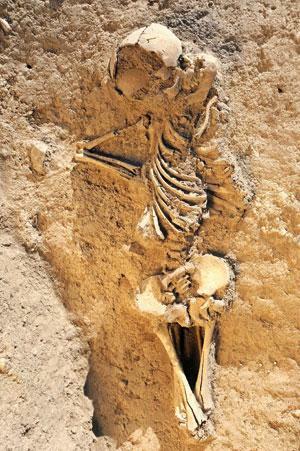 - TURQUIE : Akçalar - Ancient bodies believed to be 8,500 years old have been unearthed at a burial mound. The five bodies, reportedly belonging to two adults and three children aged between 3 and 5, were found at the Aktopraklık mound. Their arms were tied behind their backs, indicating that they may have been killed or sacrificed. One of the children were hogtied while the other children were found between the legs of the adults. Archaeologists have reached very important traces of Neolithic and Chalcolithic periods. - ROYAUME-UNI : Ile de Man - Investigations into the mysterious death of a Bronze Age man are helping to paint a picture of life on the Isle of Man over 3,000 years ago. During excavations at Ronaldsway in 2008, three burial sites and the remains of a village were unearthed. Archaeologists found that one skeleton bore the marks of a violent death. Allison Fox from Manx National Heritage said: "We found cut marks to his fingers, ribs and knees, as if he'd been defending himself." "He sums up what was happening at the end of the Bronze Age. "Society was changing, climate change was occurring and there was more competition." - AFGHANISTAN : Mes Aynak - Work on Mes Aynak ("Little copper well") has proceeded at a rapid pace since it began in May, because the archaeologists—16 Afghans and two Frenchmen from DAFA (Délégation Archéologique Française en Afghanistan)—are racing against time. Within three years, the site is slated to be destroyed by Afghanistan's largest single foreign investment, a Chinese-run copper mine not 900 yards away. The plan is to document the site thoroughly and attempt to remove as many of the smaller stupas and statues as possible for conservation in the National Museum or possibly a future local museum. Because the buildings are mudbrick and schist, a wholesale relocation isn't possible. 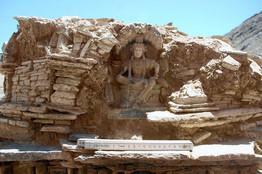 Mes Aynak was begun in the first century, but most of the ruins he showed me date from the fourth and fifth centuries. During that period, and for the next century or two, it's possible that Afghanistan was ruled by a theocratic Buddhist kingdom. - ISRAËL : Beit Horon - L’événement est d’une telle importance qu’un grand rassemblement est prévu sur le site durant Hol Hamoed souccot. Au hasard d’une promenade, un habitant de la localité de Beit Horon a découvert aux alentours un antique site comprenant au moins six villages des époques du 1er et du 2e Temple. Ayant aperçu deux colonnes de marbre parmi des oliviers, puis des vestiges de mosaïque, Shaï Laszlo a immédiatement averti l’archéologue du district, Benny Har-Even. Ce dernier a fait effectuer des fouilles plus approfondies et a découvert un périmètre de plusieurs dizaines de milliers de dounam. Pour l’archéologue, « les éléments recueillis sur place indiquent avec certitude qu’il s’agissait de villages juifs : des bains rituels, des pressoirs, des caveaux familiaux, des mosaïques et des outils que seuls les Juifs utilisaient ». Har-Even révèle « que des vestiges avaient déjà été mis à jours non loin de là, lors des travaux de la barrière de sécurité, mais ceux qui étaient sur place pensaient qu’il s’agissait de sites de l’époque byzantine, avant de se rendre compte qu’il s’agit en fait de sites juifs. Par ailleurs, on y a trouvé des restes de synagogue sur lesquelles ils avaient été construits ». 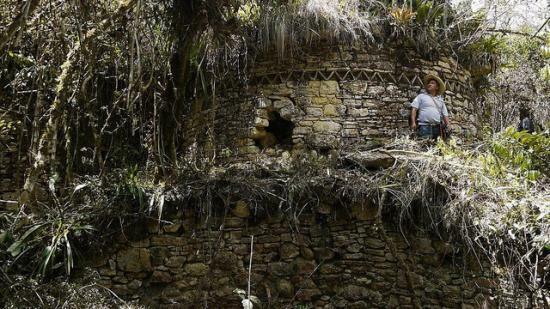 - PEROU : Atumpucro - An archaeological complex full of typical Chachapoyan round builds has been discovered in the district of San Juan de Lopecancha, province de Luya in the Amazonas region. The complex, named Atumpucro for the hill it sits on, is located on the western side of the Utcubamba river a two hour drive and 40 minute walk from the modern city of Chachapoyas. The site appears to have an extension of more than two hectares and about 150 homes in a good state of preservation. All the houses have rectangular windows, niches and friezes all around. The houses are build upon large terraces and there are impressive walls about 50 metres long and 3 metres. - ISRAËL : Herodium - A royal box built at the upper level of King Herod's private theater at Herodium has been fully unveiled in recent excavations at the archaeological site, providing a further indication of the luxurious lifestyle favored by the well-known Jewish monarch. The theater, first revealed in 2008, is located halfway up the hill near Herod's mausoleum. The highly decorated, fairly small theater was built in approximately 15 BCE, which was the year of the visit of Roman leader Marcus Agrippa to Judea, Emperor Augustus's right-hand man. The royal box (measuring eight by seven meters and about six meters high) is the central space among a group of rooms attached to the upper part of the theater's structure. This impressive room likely hosted the king, his close friends and family members during performances in the theater and was fully open facing the stage. On the upper parts of the walls are the room's highlights: a series of unique “windows” painted with "outfolded" shutters on either side and various naturalistic landscapes within. They include scenes of the countryside, the Nile River and a nautical scene featuring a large boat with sails. One can identify features of trees, animals and human beings. 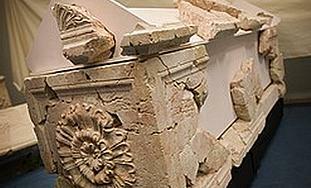 Some of these windows have survived intact on the walls, whereas others were found in fragments on the floor and are undergoing restoration in the Israel Museum's laboratory.Painted windows with shutters appear in the late Second Pompeian Style in Italy, and mainly depict unrealistic views like theater settings and still-life. The closest parallels for the windows at Herodium are known from the "Villa Imperiale" at Pompeii, dated to the early Third Style of painting between 10 and 15 BCE. Its back and side walls are adorned with an elaborate scheme of wall paintings and plaster moldings in a style that has not been seen thus far in Israel; yet, this style is known to have existed in Rome and Campania in Italy during those years. This work, therefore, was probably executed by Italian artists, perhaps sent by Marcus Agrippa, who a year before his visit to Judea met Herod on the famous Greek island of Lesbos. The data accumulated during the excavation proves that the theater's lifetime was very short, less than ten years. It appear that the theater deliberately destroyed slight before Herod's death in order to preserve the conic shape of the artificial hill of Herodium. During the construction of the artificial hill (as well as the famous monumental stairway which begins at the bottom of the hill), parts of the theater, including the "royal box," were temporarily used by the builders, leaving their footsteps in the form of subdivision walls, cooking installations and graffiti. - ALLEMAGNE : Harzhorn - New finds at a well-preserved ancient battlefield in the north of Germany are not only rewriting geo-political history, but also revealing some of the secrets of Rome's military success. Until only two years ago, northern Germany was believed to have been a no-go area for Roman troops after three legions were wiped out by German tribesmen in the Battle of the Teutoburg Forest in AD 9. The revelation that two centuries later a Roman force mounted a punitive raid deep inside the tribal areas in AD 235 has changed all that, suggesting that a soldier-emperor, Maximinus Thrax, seriously attempted to subjugate the north of Germany. The debris from the battle is scattered over a wooded hill, the Harzhorn. An archeological dig there this summer turned up 1,800 artefacts. A single spot on the hill had been pounded by torsion catapults, one of the most advanced weapons in the Roman arsenal, and 70 bolts from these armour-piercing weapons were still lying in the ground. The catapults, mounted on wagons, had a range of up to 200 metres. The iron points weighed 200 grams apiece. The Romans' supremacy was also partly based on the varied skills in their multi-ethnic army. Among the auxiliaries they employed on the Harzhorn were Moroccan javelin men and Middle Eastern archers. - ROYAUME-UNI : Slackbuie - Inverness - A Bronze Age burial site has been uncovered at the planned location of the new supermarket. Archaeologists found an area of cremation pits surrounded by a ring ditch. Almost 2,000 flints were also recovered from the field. Pieces of Neolthic pottery known as Unstan Ware were also discovered during digs.